So what if a century has passed since Pomona College sent a player to the majors? 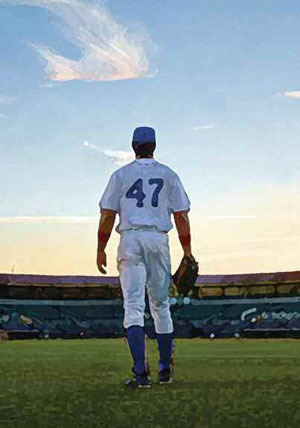 Sagehens have left their tracks on the national pastime in all sorts of surprising ways, racking up win after win for the liberal arts. 1) Computer baseball: The first interactive baseball computer game was born in Mudd-Blaisdell. Here’s how a would-be playwright and a ballet dancer became video game pioneers. 2) The Ultimate Baseball Roadtrip: Over 16 years, Mike Luery ’77 and his son visited ever Major League ballpark in North America, somehow surviving those tense teen years. 3) The Nation’s Smartest Stadium Restaurant: With his acclaimed restaurant in the shadow of Boston’s Fenway Park, Garrett Harker ’89 offers a brainy beacon amid a sea of beer-soaked sports bars. 5) Big-League Books: Sagehen wordsmiths such as Professor Jonathan Lethem contribute more than their share to the ever-growing trove of baseball literature. 6) Baseball Worldwide: From Brussels to Tel Avis to Taipei, Sagehens play an outside role in helping to spread baseball fever beyond the bounds of North America. 7) Goofball Classic: A quarter century after its release, the movie Major League by David Ward ’67 has only grown in its appeal as baseball fans’ favorite funny flick.